(1) With the 2 x MBBF's out in front makes it easier to get to, and work on the RFF if needed. (2) Probably more importantly is with 2 x fish tanks, the temptation to heavily stock is covered and any extra bio filtration will always help. Cheers thanks I'll go with that - got any links on a good MBBF design? 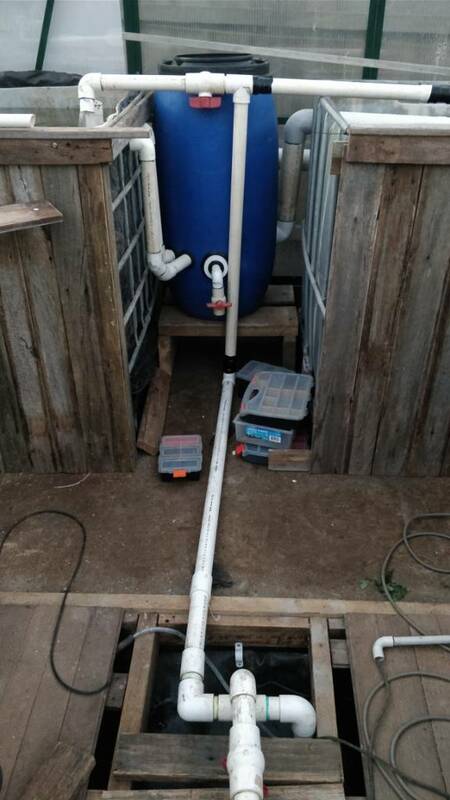 Jay I went with Porter from Macedon Ranges Aquaponics design for both my RFF & MBBF, they are cheap and easy to build. The only thing I would add is a tap/ball valve 1/2 to 3/4 of the way down the barrel on the RFF to drain off the top water before you drain the solids from the bottom 1/2 or 1/4 as Mr Damage suggests. You turn your pump off and wait 10 minutes for the solids to settle on the bottom, then drain off the top water, then you can remove the solids. I will make this modification very shortly, thanks Mr. Damage. Jay with the bottom pickup, make sure you cut the slots small enough in the MBBF pickup that the bio media can't get out. I also made the hole in the side of the barrel 10mm lower so it would keep pressure down on the pickup and keep it hard down on the bottom. Jay you can see my filters linked below. Fascinating reads over at http://macedon-ranges-aquaponics.tumblr.com/ thanks JoeBlow. 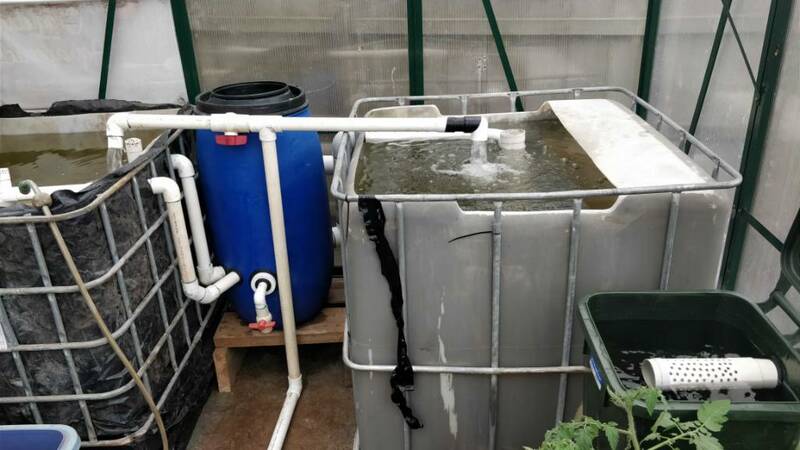 It's always a great read on his site Boss, he's very clever and has a lot of advice on aquaponics and has helped me quite a bit with re-designing and fine tuning my system. He's always willing to help and point people in the right direction. He's been studying and very busy of late so his website is not currently up to date, and I'm sure his next build will be bigger and better than his last when it happens. The filter isn't full of bio media yet and I haven't plumbed the cleaning outlet, but the RFF is done and everything is working!! Jay shade cloth would be OK, I have stainless steel bolts with the thread sticking up on the IBC that I just stretch fine white bird netting over the metal threads, the same bird netting as in the photo. It's nice and tight so the fish can't jump out and it's easy to remove. 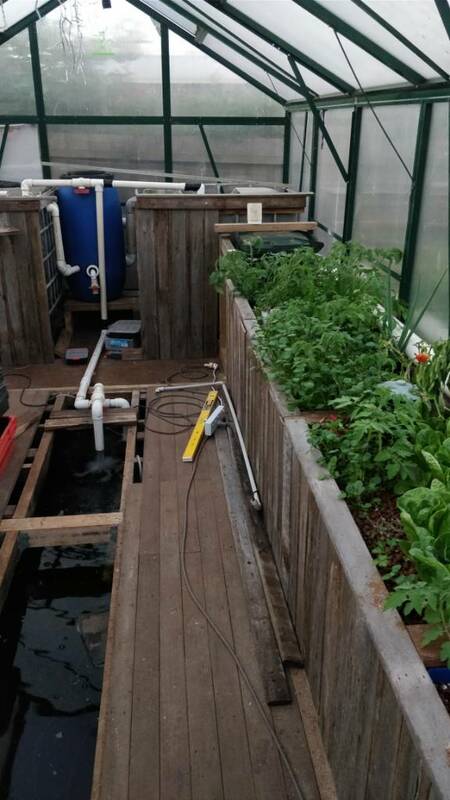 It's all coming along nicely Jay and it will be very productive system for a small space, well worth all your effort and hard work, well done. My fish tank has timber lids that kept a lot of light out while it was out in the sun, but now it's in the fernery I don't bother using the lids because no sun hits the tank anymore and the bitter melon helps shade it a bit also.